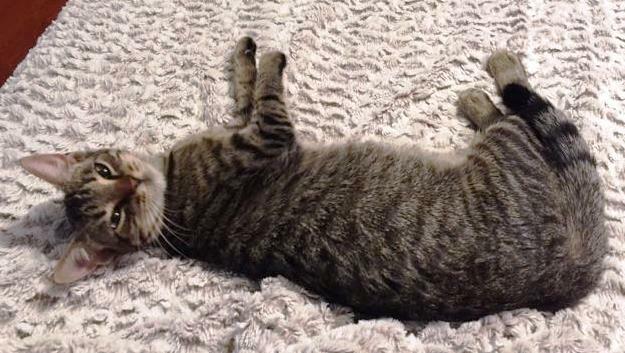 Whenever I get a call to rescue an unknown cat, I always have two concerns: (1) will the cat be cooperative, and (2) what do we do with the cat after I rescue it. Regarding the first concern, I have been very lucky in that almost every unknown cat I have rescued turned out to be friendly, sweet and cooperative. I have been less lucky with the second concern, since there have been a number of times when I have had to take the cat home with me and foster it until a new home can be found. 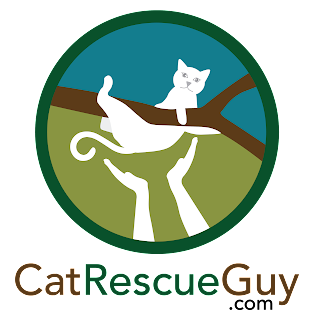 So when I got the call from Liz in Abita Springs to rescue an unknown cat in her tree, I was especially worried about what to do with the cat, because I was already fostering a kitten from an earlier rescue of an unknown cat. I can't foster any more cats right now. Fortunately, Liz put a big smile on my face when she said she would take responsibility for the cat. She would either find the owner or keep it herself. 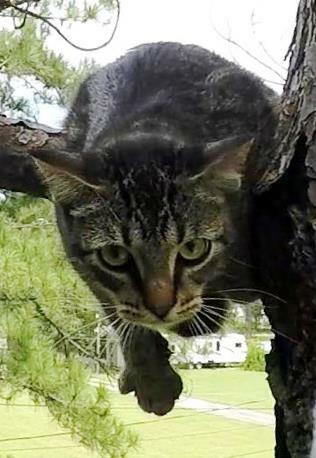 When I arrived at the site, without any assistance, I quickly found the cat in one of several pine trees in the front yard. 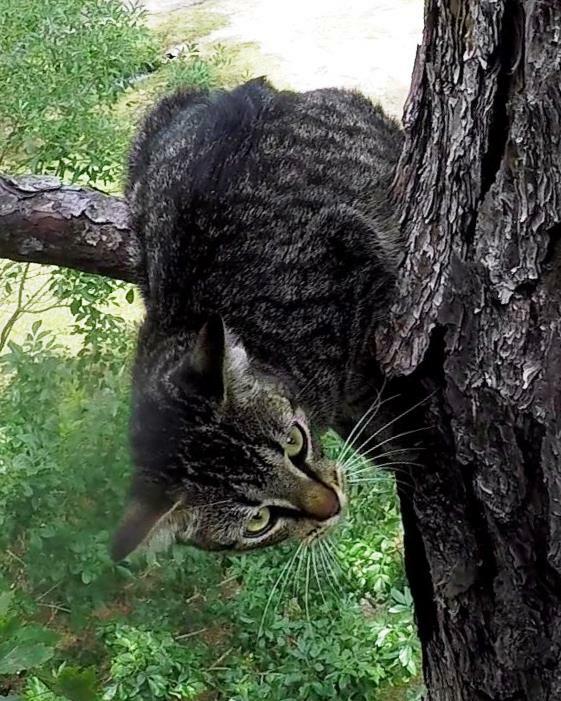 The gray tabby gave away her position by crying out to me as she perched about 30 feet high on the lowest branch of the tree. This crying out to me was a good sign, because I took it as an indication that she would be glad to see me in the tree. I was right. When I set my rope in the tree, she showed signs of being a little distressed, but not so much that she felt the need to climb higher or walk out to the end of the branch. She stayed in place and calmed down by the time I was ready to climb up to her. As I climbed up to her, she continued to watch me and call out to me. She looked happy to see me, so I knew she would be an easy rescue. She was very relaxed and comfortable with my touch, so I petted her freely. She was perched precariously on the branch and lost her balance at one point but recovered nicely. While we were getting acquainted, she showed signs of wanting to get in my lap, and as I pulled the carrier up for her, she stepped in my lap. I held the carrier in front of her and she readily walked inside. I didn't need any food enticement; she was simply ready to go. That's about as easy as it gets. After a quick and easy descent, she was back on the ground where I handed her off to Joe who took her inside. Joe and Liz had already prepared a place for her and were ready for her. Joe released her inside where she began to eat the food he had already prepared for her. I scanned her for a microchip, but none was found. It was easy to see that this cat was in good hands. I left there knowing that they would make an effort to find the owner, and if no owner was found, they would be happy to have her and give her a very good home. 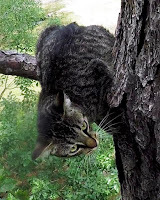 This cat was very lucky to have gotten stuck in their tree. She knows how to pick them. Liz told me later that she would name the cat Sassy if the owner was not found. She sent me this picture of her resting on the bed afterward. 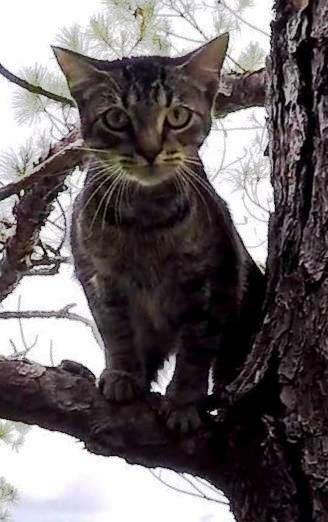 Thanks Liz and Joe for caring about this unknown cat in your tree and for taking good care of her.